Graduation is coming in hot!! You scared? You nervous? Totally understandable. You are, once again, about to venture into the unknown. You’re either at the top of the food chain right now, or maybe you’ll be entering your senior year (and getting king/queen of the jungle status) after the summer. You’re one of the Old Guard at Central High. A grizzled veteran of primary academia. You’ve gone through the K-12 schooling crucible and you’ve come out the other side (mostly) unscathed. We’re proud of you. But the fight to acquire knowledge isn’t over. The good news is: you’re a little bit ahead of the pack. 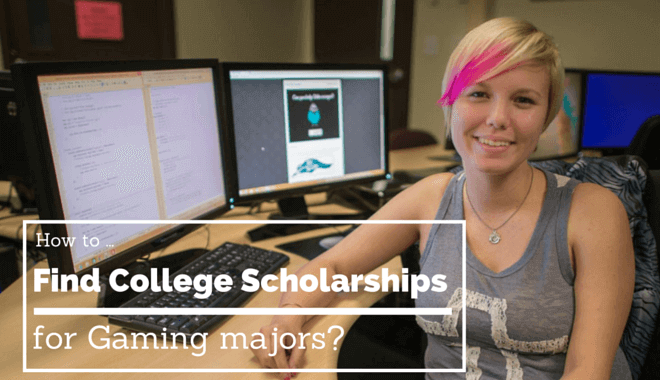 You think that you might enjoy pursuing a gaming major. Whether it’s animation, game design, computer science, or some other related field, you’ve set your sights on an academic end goal. If you change your mind along the way, that’s fine, but for now you want to give a gaming major a shot. Just because you want to design games for a living doesn’t mean you’re willing to break the bank to do so. Before you can start earning from a career in game development, you need to pay. College is expensive these days. The good news is, you have a number of video game design schools at affordable and semi-affordable colleges. And the even better news is, you can get some scholarships! Don’t let the title of the scholarship program fool you; you do not need to be specifically pursuing a degree in animation. This scholarship applies to other related fields. The program’s site lists eligible degrees as: 3D animation, computer animation, digital design, game development, and game design (there are even more, but these are the most applicable for gaming majors). The scholarship prize? A single scholarship is awarded annually to a graduating high school senior, in the amount of $1,000 dollars. To be eligible, you’ll need to be planning to attend a postsecondary school with accreditation. To compete for this scholarship, you’ll need to have a successful academic record, and you’ll need to whip up an essay (between 500 and 1000 words). The essay for this year covered this topic: What specific skill do you most want to develop? You can find all the details, and start the application process, over at ARC. Every year, the submission deadline is June 1st (just missed this year! ), with the winner announced in July, and the scholarship funds distributed in August. If you’re a high school junior now, this is a good scholarship to add to your “opportunities” list for next year. You are only eligible for this scholarship opportunity if you are a full-time undergraduate student going into your sophomore year of college (that’s your second year, FYI!). You need to be pursuing a career that will eventually get you into the game industry. You need to maintain a 3.3 GPA for this scholarship, so make sure you’re in it to win it, academically speaking. This scholarship is quite the prize horse. There are two winners, and those rewarded with the scholarship receive $2,500 dollars. Here is a link to the website www.interactive.org. And for a link directly to the 2016/2017 application, click here. Your application needs to be submitted by June 30th! There is little time! Some other notable criteria: two letters of recommendation, a maximum two-page letter explaining your studies and how you’ll benefit the industry, as well as your financial need situation. This fund is looking to help people in a very tight financial spot, but don’t let some financial security stop you from applying; better to apply and be denied than to have wondered but never tried. If you’ve assembled a real Ace squad of game design friends, there’s a way for you to team up with them and earn some serious real-world loot. Microsoft offers an annual competition, called the ImagineCup, where teams of up to four eligible students compete in one of three different categories for serious prizes. One of the big competitions is the Games Competition, where each team is responsible for developing a complete piece of software. The presented software needs to be completed in a way where the judges are able to use it, play it, and judge it. The grand-prize winner in this category takes home $50,000 dollars. This is money that can be used for anything (like furthering your education!). The primary eligibility requirement is that you’re at least 16 years old. For the competition, you’ll be using Windows design software to program your games. Games could be desktop, mobile, or browser-based. You need to sign up by January in order to compete in that year’s games. They get underway that same month. You can head over there to check out the current competitors right now, as they’ve only just wrapped up the semi-final stage of the competition. The 2016 World Champion has yet to be crowned. These are just the tip of the iceberg! 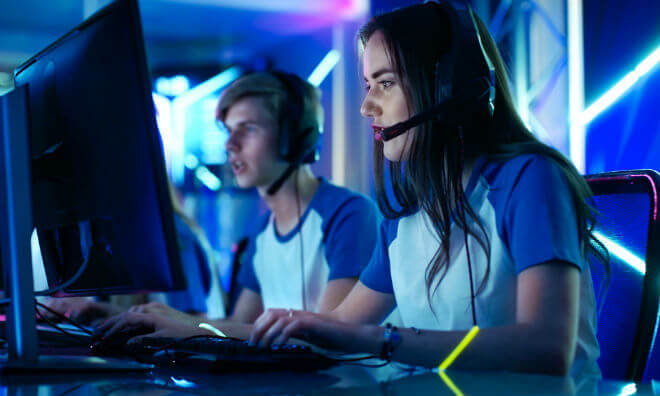 Whether you’re in high school or college, solo or teamed up, there are ways for you to chip away at the tuition costs of your gaming degree. It doesn’t stop with the few scholarships we’ve listed above. We just wanted to let you know the opportunities are out there; There are tons more to choose from. Check out this list at MyCollegeOptions for a wealth of potential scholarships. CollegeScholarships is another helpful site, providing even more scholarship opportunities. The internet is your friend with this one. And, why not, here’s a third list of scholarships, from FastWeb. Just for good measure. There’s nothing precluding you from applying for more than one scholarship, either. Don’t be afraid to crank out applications. Scholarships for $500 or $1,000 dollars might not seem like much on their own…but if you bag a few of them, all of a sudden you’re making a nice little dent in your future college loans. And of course, this article only focused on the scholarships specific to game industry majors. There are plenty of “general” scholarships out there for which you can apply regardless of certain criteria (like your major, your financial situation, or your academic standing). Putting a little time in now can save you thousands of dollars later. So…do it! Varsity esports are catching on in universities around the US. Yes, you read that right: Varsity esports. Colleges are adding varsity gaming teams to their other varsity sports rosters: football, basketball, esports. This varsity designation means extra funding from the school. And extra funding can mean scholarships. Esports scholarships are scholarships given by the school to support their players and help them pay for their education. The amount will vary from school to school. Some schools pay $2000 per player. Other schools are offering full rides for their esports athletes. This will depend on the size of the school, the size of the program, and the amount of support the program has from the school. Athletic scholarships (esports included) are often based on the player’s athletic ability and tend to be determined by the coach. So, the better you play and the bigger impact you have on the team (and their W/L record), the more money you stand to receive towards your tuition. The National Association of Collegiate Esports is working on putting scholarships together, but don’t offer them quite yet (NACE is the biggest collegiate Esports organization in the US). Let’s look at some schools and other scholarship programs that can help pay your way. UCI focuses on two games for their esports program: League of Legends and Overwatch. They also offer scholarships. Their League of Legends scholarship values sit around $5,610. For Overwatch, the value sits a little lower at $2,500. The competition is stiff at the University of California-Irvine. For one, you need to be a full-time student. Two: If you’re playing League of Legends, you have to be ranked at least at Master level. For Overwatch, you need to be at the Grandmaster level. To give you a sense of what that means: The Grandmaster level in Overwatch is the top 1% of players in the competitive tiers. For League of Legends, Master Tier is the level above Diamond. There’s no limit to how many players can be in the Master Tier at one time. UCI takes their varsity esports more seriously than some other schools, but they also award substitute players the same scholarships as the starting lineup. So, if you’re already ranked appropriately, or really close to doing so, it’s worth taking a shot at applying. The University of Akron is much less stringent in their gaming skill requirements–they encourage players of all skill levels to try out. While they absolutely have a scholarships available to their esports athletes (first public school in Ohio to offer them for esports), the amount is not clearly defined anywhere. It will likely be based on your skill level in the games you’ll play for the team. At Harrisburg University, there’s only one varsity sport: esports. Perhaps that’s why HU is offering 15 full athletic scholarships to the students who make the team. They’re building teams for League of Legends, Overwatch, and Hearthstone. Based on team size and only 15 full athletic scholarships, it looks like they’re not shooting for a very deep bench. This option is great for a few reasons. One: Full rides are hard to come by. If you can get one by doing something you love, why the heck wouldn’t you? Two: They have a good program director and head coach on board. Chad Smeltz is program director, he’s also a long-time coach for esports. Jeff Wang is heading up the coaching staff, and he’s a world-ranked gamer. Three: You’re the first only varsity sport at the school! You have a chance to shape not just the program, but the universities entire varsity athletics legacy. No pressure. TXWES is another college getting into the varsity esports arena. They have three games: Overwatch, League of Legends, and Hearthstone. For scholarships, Texas Wesleyan University is offering up to 12 scholarships in the amount of $2,000. These will be awarded on your game history and also on your performance as a university athlete. They’re looking for student coaches, scouts, and opponent analysts as well, but the scholarships might only be limited to the athletes. That could change as the program grows. 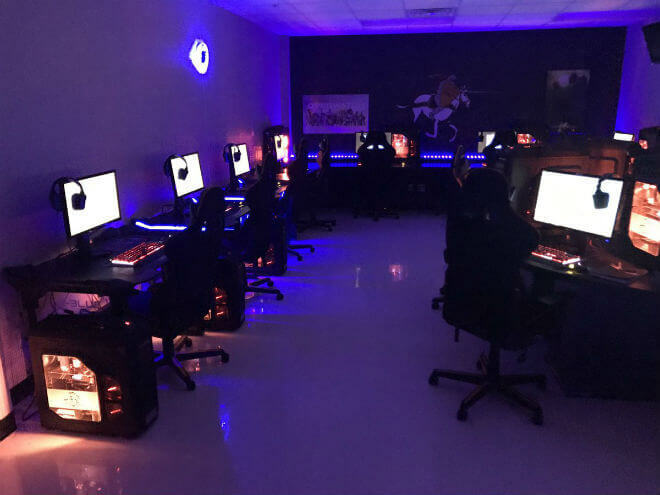 The Jimmie Athletics department kicked off its first esports season in the fall of 2017. The program is offering up to $2,000 per team member to their esports squad. Their initial goal has been to fill a roster size of 25 people. University of Jamestown has been targeting high school leagues all over the United States. If you don’t already participate in a high school league, you should consider it (we’ll link some resources in a bit). The Morningside Mustangs compete in four games: Overwatch, Heroes of the Storm, Rocket League, and League of Legends. This offers a little more flexibility in gaming choice over the typical League of Legends and Overwatch combo. And the scholarships are more generous than the typical $2,000, too ($2,000 per year is still a nice chunk of financial aid change!). 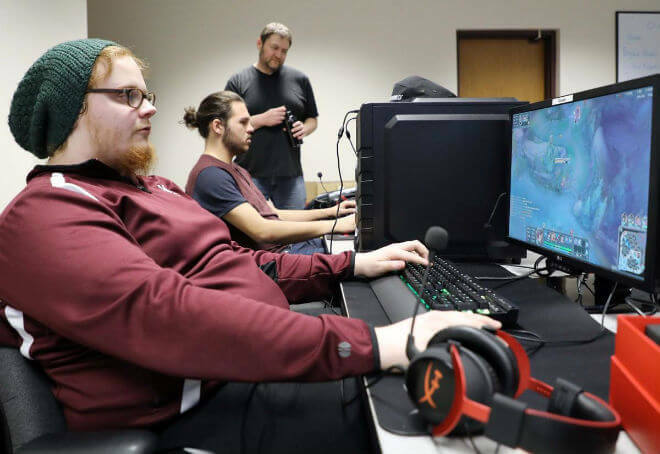 At Morningside College, varsity esports players are offered up to $5,000 per year. This figure is based on your skill level and esports knowledge. One catch here, it’s based on a “talent award.” These awards are offered through the school in general, not the varsity program specifically. That means you’ll have to apply for the award and use your esports experience to fill out the “Talent Award” section. Admissions can help you with that as you apply. There are way more schools with varsity esports programs, and a number of those offer scholarships. The scholarship amounts are not always available, it’s possible that other programs offer more aid than the ones on this list. For more schools with varsity esports program, check out our guide on the 20 colleges with varsity esports programs. For more on the High School Esports League, like how to start a team, how to get your high school involved, how to earn scholarships, and more, check out the official High School Esports League website.